In honor of this year’s Earth Day, more than a million people used social media to encourage corporations to "break free" from single-use plastics. And industries across the world are creating new innovations to increase our use of sustainable materials. To ensure that the Earth Day conversation keeps moving forward, this year’s World Environment Day (June 5) also focuses on how we can stop plastic pollution. At Unifi, we believe we can improve our quality of life by turning plastic bottles into recycled fiber found in products we rely on every day. And we stay focused by asking the question: what if just one decision could help shut down plastic pollution? With recent innovations made in textile materials, consumers no longer have to sacrifice sustainability for performance, or vice versa. According to the Global Fashion Agenda, raw materials can comprise up to half of a brand’s environmental footprint. But sustainable alternatives like Unifi’s REPREVE let brands embed a variety of technical performance properties into our recycled fibers, giving consumers the quality they seek. Volcom and many others have picked recycled alternatives to increase their use of sustainable materials and do their part to keep plastic bottles from landfills. Other options, like regenerated fibers, synthetic silk and mushroom-based ‘leather’ are resonating with mass-market and luxury brands alike. As the fashion industry’s impact on the earth becomes increasingly scrutinized, these alternative materials can assist brands in achieving their sustainability goals. But innovative materials don’t stop at the fashion industry. Automakers have challenged the status quo by incorporating sustainable materials into their vehicles, which can make them lighter, adding an extra benefit. This industry has received attention for incorporating sustainable materials like agave fiber, soy foam and others into many of their vehicles. And other industries, like hospitality and home goods, are deepening their commitments to sustainable sourcing. Designers and home buyers find that sustainable textiles complement other environmentally conscious design factors in commercial and residential design. While Earth Day and World Environment Day help increase global attention around the importance of reducing plastic pollution, brands and consumers can increase the positive impact by making sustainable decisions daily. Last year, Unifi recycled its 10 billionth bottle thanks to partnerships with some of the world's leading apparel, automotive and home goods brands. Now, our goal is to recycle 30 billion bottles by 2022, and we’ve launched the Champions of Sustainability Awards to recognize the brand partners that will help us achieve this. True sustainable innovation starts in the fiber—but it ends with brands making decisions that make a major impact in ending plastic pollution. 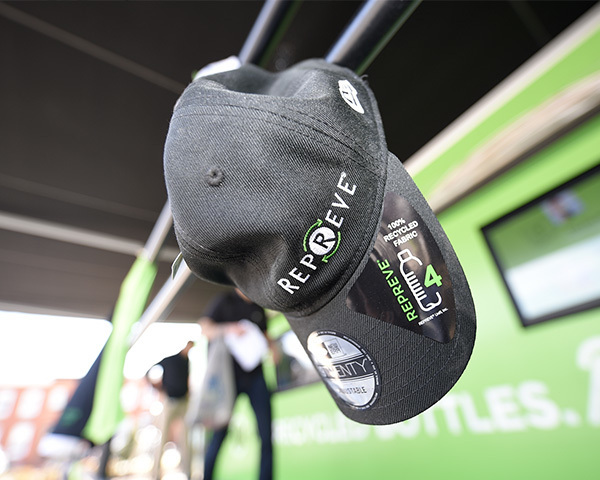 Join our REPREVE Mobile Tour at SB'18 Vancouver, June 4-7, and create a video of your company’s World Environment Day goals to show how your company is making an impact for the environment. Article featured on Sustainable Brands.